Do users really engage with your content? Use the right tool to find out! You often publish articles, run a campaign or post news worthy blog posts but you don’t really know how your readers engaged with the article or how often they shared your article. You might be measuring this by analysing scroll-depth, the bounce rate or time spent on the page etc. But that won’t give you the complete picture. In this article, I am going to show you an extremely valuable dimension that most people do not use that often. 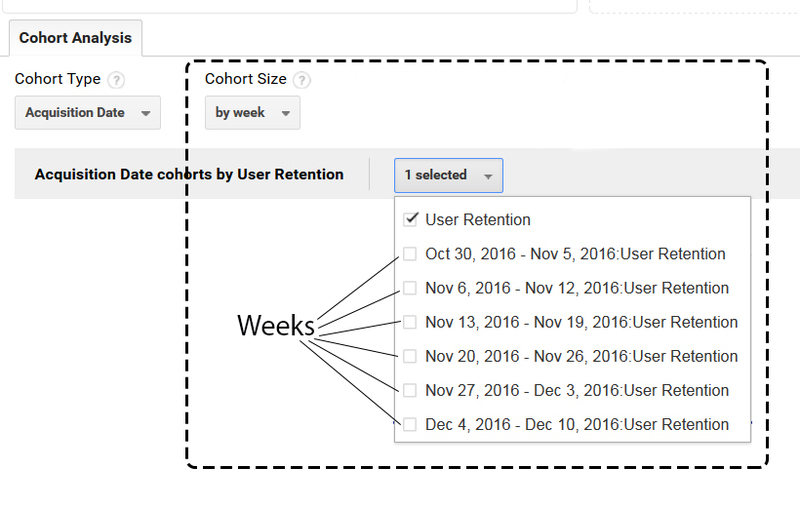 Cohort analysis in Google analytics is the tool you should use to analyse user behaviour over a short period of time. A cohort is a set of users who have a similar interest or behaviour. 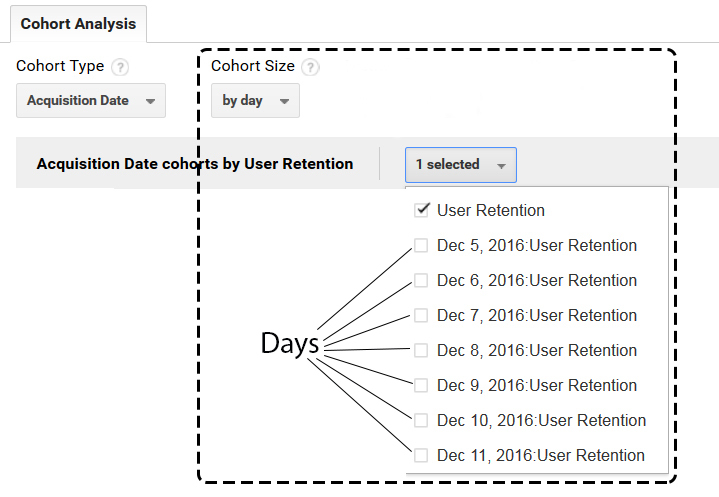 The Google analytics cohort report provides only one type of a cohort which includes all users categorised according to the date they arrived. The data that Google considers in this report is really the day that the user started the first session. 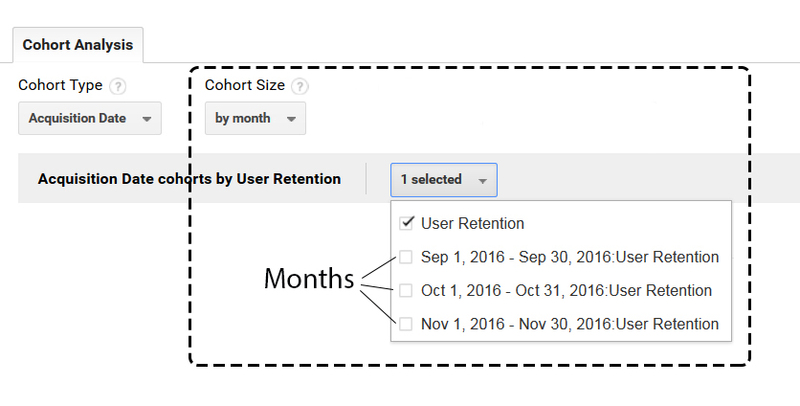 Therefore, in this beta version of cohort analysis Google only gives us one Cohort type (common attribute) and it is the acquisition date. You can find this report in Google analytics as below. Let’s try to understand the cohort report first. See the places marked in dotted lines on this diagram. These are the three main sections of this report. Tools at the top helps us to create the Graph and the tabular data in the data section. How to make the report? There are four main fields that helps us generate the report. Cohort type, Cohort size Metric and Date Range. This is the basis of the cohort. This cohort type corresponds to the table column which includes the total number of users in the cohort. In this beta version Google only provides one dimension, and it is the Acquisition date (or we can call it the users first session). Hopefully Google will come up with other cohort types very soon. How big is your Cohort? This is the time frame you want to select when looking at the cohort type. This cohort size corresponds to the cell which includes the date and the total number of users in the cohort. By day – If you select this, it means that you want to see all users acquired on a specific day. 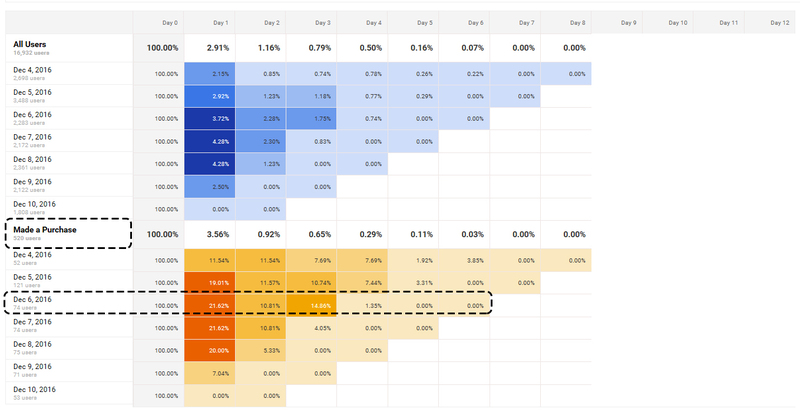 By month – Same as above, you want to see the users acquired within a specific month. In summary, Google grouped users in three separate (cohorts) groups. User’s first interaction on a particular day. User’s first interaction within the specified week, and User’s first interaction within a specified month. Once you select a Cohort size, the next thing is the “metric” that you want to look into. This will be specific to the actual data you will be seeing in the report. 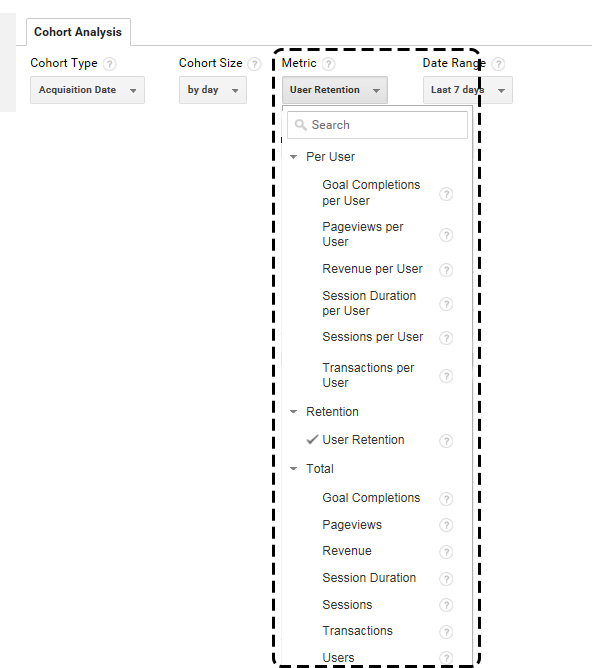 You can select aggregated metrics per user, User Retention or Total goal completions etc. You can only select one metric at a time. Metric corresponds to all columns in the table other than the first column which shows cohort type. The analysis technique is to look into a specific metric for a specific cohort to understand how that metric performs over time. What date range do you want to analyse? This is the time range for the data that appears in the table. This corresponds to the number of Rows in the table. If you select 7 days there will be 8 rows including the row with the totals, and if you select 14 days there will be 15 rows including the row with the totals. Before we start to analyse the data using the cohort analysis tool we need to know the data laid out in the table. There are 13 columns including day 0. Rows will vary from 8 to 31 as per the 7 day and 30 day reports. In this report, there are 5 colour variations Google use. Darkest represent the highest metric values, and lightest represents the lowest metric. As you can see in the above image, On Dec 5th we had 29,967 users which is 100% on Day 0. But on the next day only 4.93% returned. And then the second day we only had 2.71% returns. By looking at this data we can see how our users are coming back to the website. This way we can see whether our content is interesting enough for our users to come back again and make use of it or they simply drop out. What can we analyse with Cohort Analysis? We can use this cohort analysis for a few different types of analysis. If you are having an e-commerce business. You might see your business doing well on a month to month basis. But when you drilled down to weekly cohort analysis you might find that some days you are not doing well. By digging deeper into this particular day you might find that the marketing activities you did on the day haven’t actually made a good return. So now you know how to improve your marketing effort to boost up your sales by comparing the marketing activity initiated on the day. You can also look into a “single column” in the cohort analysis report. If you are retaining the same percentage of users across all cohorts on the second day, you know that your website is consistently giving your users a better user experience, or your site speed is relatively okay to keep engaging your user’s consistently. But on the other hand, if you see a steep deterioration of user retention at day 2 then it might indicate your website speed is not up to the level that users prefer or your content is not appealing enough for your users to come back and refer the content. Remember that the cohort analysis shows user engagement in your website. This is extremely important if you are in the business of trying to engage users in multiple occasions and need to keep them engaged regularly. And also, the cohort analysis is extremely important for businesses that runs short term campaigns and marketing efforts. Tracking both acquired users and retained users over a period of time will definitely put a smile on your face. Cohort analysis is one of the best ways to make it happen. You can also add segments to your cohort analysis report. Segmented cohort reports will be displayed in another colour on the cohort analysis page. I have applied a Segment to my cohort analysis report called “made a purchase” and now I have two reports to compare. As you can see on the 6th December, 74 new users started the purchasing journey but only 21.62% came back on the next day. On the second day after the First visit only 10.81% of the visitors returned to make a purchase and then it increased on the next day to 14.86%. Then it has plummeted to 1.35% then no one returned to purchase from the visitors who came on the 6th Dec. So, the marketing effort on the 6th Dec only lasted for three days. This way, we can analyse whether our marketing effort has been working in our favour on any particular day. As you can see, this is an extremely important tool that you can use to make your business improve user retention for every single metric. Having a complete understanding of the user retention will always help you improve your Return on Investment. Defining the right cohort to give you the right answers to your questions is very important. Using Google Analytics, you can create reports that help you answer this within a few minutes. Imagine that you need to check whether your customers are coming back after their first purchase. How did they first engage with your website? What triggers them to buy from your website? How long did they stay on a page before making a purchase? How many users reached your goals? Have the number of purchases declined over time? How many pages have they visited along the purchase journey? How did the user behave before your promotion and after the promotion? How do different genders act upon your promotional email? What age group was engaged for the longest period of time? These are all questions that can be answered by creating advanced custom cohort reports. I will be discussing this in the next article so stay tuned!